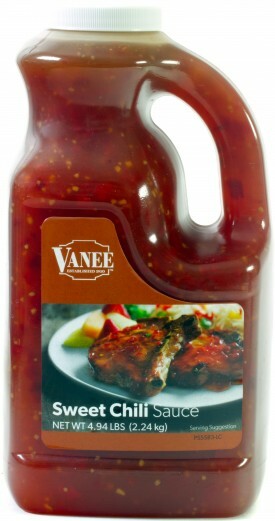 Vanee Sweet Chili Sauce incorporates savory garlic, bell pepper, and mild red chili heat for the perfect blend of ‘sweet and heat.’ This full bodied, dipping- and basting-friendly sauce practically begs for chicken wings, ribs, egg rolls and crab rangoon. Comes conveniently packed in half-gallon pour-friendly jugs; simply pour and serve. Vanee Sweet Chili Sauce has no high fructose corn syrup. Each 64 oz jug has 64 two tablespoon servings, for a total of 256 servings per case. Shake well before using. Pour and serve. Water, Sugar, Vinegar, Food Starch - Modified, Dehydrated Bell Pepper, Salt, Dehydrated Garlic, Spice, Flavoring. © 2019 Vanee Foods Company. All Rights Reserved.